Today, after almost 18 months in solitary confinement, having been denied access to lawyers, to family, to the UN Special Rapporteur on Torture, and even having been denied clothes, Bradley Manning will for the first time face a judge. At his pre-trial hearing he will be formally charged with – among other things – “Aiding the Enemy”, a crime punishable by death. Tomorrow, December 17th, will be Bradley Manning’s 24th birthday. Bradley Manning is a whistleblower who acted courageously and out of good conscience to expose the horrific murder of innocent civilians, including children and journalists, by American soldiers in Iraq. Subsequently, in a desperate attempt to take a moral stand in an immoral war zone, Manning copied 250,000 US diplomatic cables from the unsecured network in which he worked as a communications specialist at Contingency Operating Station Hammer, Iraq, and sent them to Wikileaks. The leaking of those cables has been credited with helping to spark democratic revolutions in Egypt and Tunisia but has never been shown to have been responsible for any direct harm to an American citizen or ally. Nonetheless, President Obama has prejudged Manning’s guilt, the likes of Newt Gingrich and Pat Robertson have called for his execution, and he is at serious risk of being given a life sentence. Bradley Manning may never again have a moment’s freedom because he chose to expose immoral and illegal actions by his fellow Americans. UNLESS WE FIGHT FOR HIM! 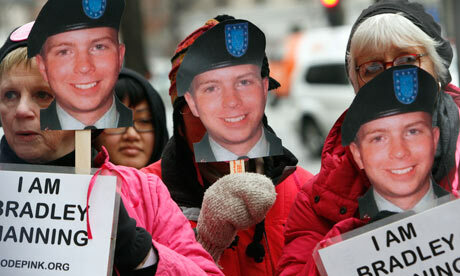 Bradley Manning does not deserve the treatment he is receiving at the hands of the Obama administration. Moreover, this appears to be only the beginning of an attempt to refocus the ‘war on terror’ towards the American domestic sphere, something I warned about several years ago in an article called Stopping the Copyright Wars of 2017. Specifically, Obama is about to sign into law a bill that will allow the indefinite imprisonment of American citizens by the military without a trial. So if you don’t want to see Bradley Manning disappear forever, and if you don’t want to see the American government approve a law that gives them the legal right to arrest and detain indefinitely anyone anywhere, including their own citizens, take steps to inform others about these events and make your voice heard in protest.